Lock in a great price for Hotel Alpestre – rated 8.9 by recent guests! Friendly staff, great breakfast, amenities very good. The location was fantastic. On the edge of a main street but within easy walking distance to downtown. The breakfasts were fantastic and the staff were very nice, without exception. The outdoor area was very relaxing and had two pools. No geral muito bom, voltarei com certeza. Ótima estrutura, café da manhã bem completo, quarto amplo e bem cuidado, clima de muito sossego e tranquilidade, ótimo para famílias que procuram um descanso entre os passeios na região. Excelente a acomodação. Lugar com bastante verde e tranquilo. Excelente o atendimento dos colaboradores. Ótimo café da manhã. O cafe da manha e exelente, todos os funcionários são extremamente educados e muito carismáticos. Hotel Alpestre This rating is a reflection of how the property compares to the industry standard when it comes to price, facilities and services available. It's based on a self-evaluation by the property. Use this rating to help choose your stay! 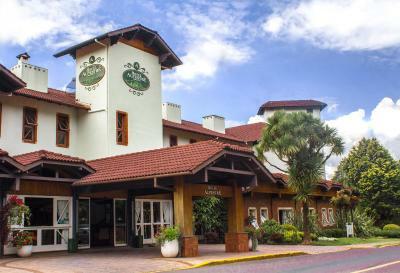 One of our top picks in Gramado.This charming hotel is set in a 12 0 ft² green area in Gramado, 0.6 mi away from the Black Lakefront. Its leisure facilities include 2 outdoor and 1 indoor pool, a tennis court, as well as free WiFi. Rooms at Hotel Alpestre have luxurious interiors with an alpine style. They all feature air conditioning, heating system, LCD TV and a private bathroom. Guests at Alpestre can enjoy a rich breakfast buffet and make the most of the handy room service options. Complete meeting facilities are also available. 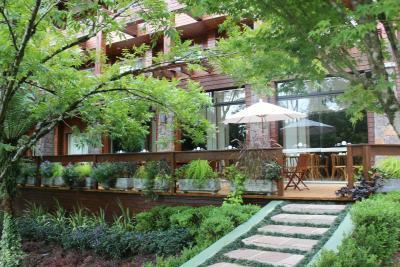 The hotel´s garden is ideal for walks, picnics and outside games. Within its premises, guests will also find La Montaña, their on-site coffee shop. 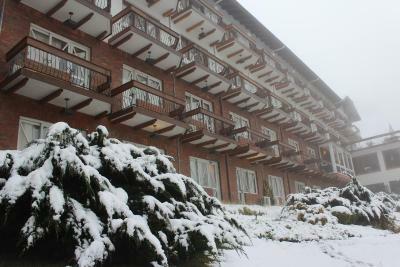 Hotel Alpestre offers a car rental service, private parking and a complimentary shuttle service to Gramado´s city center. When would you like to stay at Hotel Alpestre? This room has additional space and large windows with nice views of the surrounding park. A safe, hairdryer, minibar are also available. Wi-Fi is free. Private parking is available on site (reservation is needed) and costs BRL 23.10 per day. This room has large windows and beautiful views of the surrounding park. A safe, hairdryer, minibar are also available. Wi-Fi is free. This room has additional space and large windows with city views. A safe, hairdryer, minibar are also available. Wi-Fi is free. This suite offers an additional room with 2 sofa beds, 2 TVs, a mini-bar, a dressing room and free WiFi. This spacious room features park views from the balcony. A cable TV, a mini-bar, a dressing room and free WiFi are also included. With a hot tub and a king bed, this suite has Provencal décor and park views. The bathroom features KUR amenities. A safe, hairdryer, minibar are also available. Wi-Fi is free. This suite features 2 TVs, an additional room with 2 sofa beds, a mini-bar, a dressing room and free WiFi. This suite features a balcony, 2 cable TVs, a mini-bar, a dressing room and free WiFi. Set in a wooded park of 10,000 m², a few minutes from downtown, the traditional mountain style with wood decoration predominance brings elegance and warmth to the european inspired environments. 122 comfortable and well decorated apartments. House Rules Hotel Alpestre takes special requests – add in the next step! Hotel Alpestre accepts these cards and reserves the right to temporarily hold an amount prior to arrival. Green view from the window. The café could have been nicer in décor and in food selection. It was the only place to order anything other than breakfast. Carpet in all common areas. Friendly staff and good gym facilities. Old carpets in the hotel, entertainment toys for children quite used. Special menus available for Kids!